What does drenched book mean? All the examples I've found are from Osmania University Library in Hyderabad. Could this be a term specific to Indian-English or a mistranslation from Hindi or another Indian language? This is not an official source, but according to Charles Wm Dimmick on alt.folklore.urban Google Groups, the explanation is more plausible than that the book got wet. there, but the "THIS BOOK IS DRENCHED" =A0is the first thing to appear. That doesn't mean anything idiomatic in English as far as I am aware, my best guess is that it somehow indicates the program, user, or method that was used to scan/rip the book and upload the contents to archive.org. Whatever that means. I assure you, this is not a part of the original Tolstoy. Here's another, The Bantu Speaking Tribes Of South Africa, that also begins with "THE BOOK WAS DRENCHED". 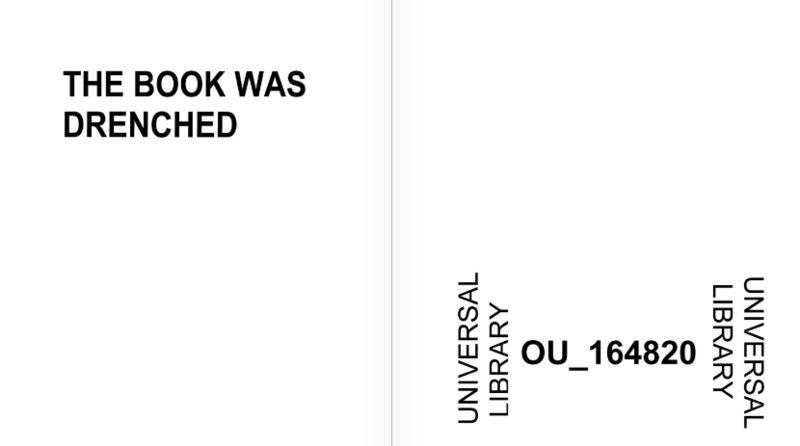 So no, it wasn't added by the author or publisher, it was added later sometime in the scanning/OCR/upload process. Just ignore it. Maybe the book was retrenched. Well, library space costs money and they're getting smaller and smaller. Of course that person would not know the word 'drenched' or its meaning either. Head librarian says: when a book is scanned we need it to say on the first page, "the book was retrenched." The assistant hears an unknown word and phonetically types out another unknown word: the book was drenched. This book is going to be recycled. This book was drenched. This is much less likely because Indian universities are bureaucratically very serious places without any sense of wit or humor. A University is a 'temple of learning' where students come to acquire Knowledge for a better life -- this is no place for subtle linguistic wit and riddles -- keep your humor outside the Library Door! So I leave you with Dante's immortal quote until we can get a more factual answer. Important note to would-be editors of my answer: since I should prefer to be subtle once in a while, please do not find, copy and paste-in Dante's immortal quote referred to ironically here. Let interested readers follow the link and learn more. Not the answer you're looking for? Browse other questions tagged meaning-in-context indian-english sentence-meaning or ask your own question. Which word begins with “y” and looks like an axe in this picture? What does “covfefe” exactly mean? What does the term 'consequential seniority' mean? What does “is there any book around …” mean? What does this sentence from a Computer Book mean? What does “say mass” mean? What does “90m-strong” mean here? What does “has… been” mean? What does “as…as” mean here? what does “getting faded” mean? What does “traffic shot by so close” mean?